← PORTLAND OR BUST: Wine Bloggers Conference this week. Planes, Trains, and Automobiles! I’m in Portland, Oregon for the 2012 Wine Bloggers Conference. Left Gainesville, FL at 10:51am, changed planes in Charlotte and again in Phoenix, arrived about three hours ago, took the MAX lightrail to downtown Portland … long day. 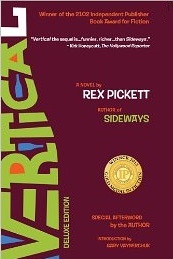 During the trip today, I read Rex Pickett’s newest book, Vertical. Remember his earlier book and movie Sideways? Besides winning an Academy Award for Best Adapted Screenplay, the movie was an unexpected game-changer for the wine industry. The subject matter of this book is a bit more difficult than Sideways: While the two guys take another road trip and have their share of wayward adventures, this time they deal with things like family alcoholism and end-of-life issues. To my delight, Vertical happens to be largely about Willamette Valley, Oregon, where the Wine Conference this week is taking place. Mr. Pickett is one of the keynote speakers (Saturday afternoon). I confess I grew a little weary of the bickering dialogue between “Miles” and his mother, but still recommend this book as a fun diversion to read on vacation. But don’t leave it out where the kids can find it, as it’s pretty juicy in spots. Over ‘n’ out; time to turn in.